Finalists screenings for NBCUniversal’s 8th Annual Short Cuts Festival were held recently at the Directors Guild of America where winners were crowned in various categories. 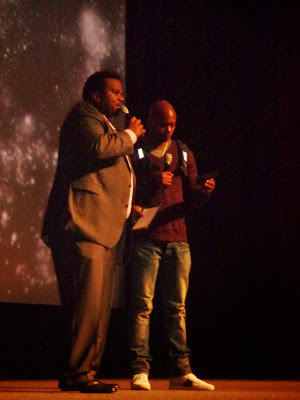 The event, hosted, for the third time, by funnyman Craig Robinson (The Office), showcased the eight diverse films that made the final cut of the 1400 short films submitted. The Chilling Visions Award went to Honeymoon Suite, directed by Zao Wang and written by Wang and Tom Toro. Best Writing went to Kevin Lau and Nyssa Chow for Made in Chinatown. Best Actor was a two-way tie with both Tim Chiou, who starred in Made in Chinatown and Dayton Sinkia, who starred in Goldtooth, taken home an award. Best Director went to Zao Wang for Honeymoon Suite. Best Short went to Kevin Lau for Made in Chinatown. The award was presented by actor Marlon Wayans. Comedian Dave Chappelle presented the Audience Award for Best Short to A Different Tree, directed by Steven Caple Jr. and written by Victoria Rose. “I think the shorts are a great forum to see what you can do in five minutes,” said Wayans. The eight films included in the finalists screenings included: Made in Chinatown, directed by Kevin Lau and written by Lau and Nyssa Chow; Goldtooth, written and directed by Laure Brinkman; Mi Corazon, directed by Marielle Woods and written by Jason Lazarcheck; A Different Tree, directed by Steven Caple Jr. and written by Victoria Rose; Commuters, directed by David Rowe and written by Rowe, Rell Battle and Luke Curry II; Plan B, written and directed by John Lopez; Pilot Season, directed by Aristotle Athiras and written by Fahim Anwar and Honeymoon Suite, directed by Zao Wang and written by Wang and Tom Toro. “The purpose of this event is to identify new writers, actors and directors,” said NBCU Short Cuts Festival Executive Producer Kendra Carter. “To NBC Universal, I want to thank you for promoting diversity,” said NBCU Short Cuts Festival Founder Wil Sylvince. “This is a much needed pipeline for new talent,” said Jennifer Salke, president of NBC Entertainment. NBCU Short Cuts is an NBCUniversal company-wide initiative to discover diverse voices both in front of and behind the camera. It provides creative individuals of diverse backgrounds an opportunity to get their materials in front of key decisions makers from the entire NBCUniversal as well as agents, managers, producers and other industry players. Ron Burgundy Spreads Halloween Cheer!